Now that Ethan is almost two we seem to have days where I feel like he is into everything and nothing all at the same time. What a contradictory statement right? If you are a toddler parent though I'm sure you know what I mean. He's into everything I'd like him not to be into (like the freezer, the cabinets, the dog bowl) but if I try to distract him with toys his attention span for those might last 30 seconds at best. He's also at the point where he's ready to start learning and I've got a general list of things I'd like him to know before he turns three. The problem is...I don't know how to teach him. At first he responded well to me telling him what something was and then repeating it back to me. Now when I ask him questions I'm either ignored or I get his irresistibly cute, but equally irritating "Nooooo". I was not very into school. I was in all the honors classes and such, but it didn't come easy for me. The problem was I never really knew how to study. Therefore I think it makes it difficult for me to teach. I don't want Ethan to have to struggle like I did and I'd like to do my best to get him off to a great start. Last night I started researching on Pinterest for toddler friendly learning activities and I gathered that maybe I was going about this whole learning thing the wrong way. He's simply not ready for me to quiz him. He just wants to explore. The idea is that through exploring hopefully he will organically learn all the things I'm desperately trying to teach him. So I hit up Pinterest for some ideas and came up with at least 30 that I can start trying out. At first I was looking for worksheets. A teaching plan if you will. As usual, I was ahead of myself and rushing things. After everything I saw on Pinterest I learned that teaching a toddler is all about fun and exploring the senses. The biggest thing I picked up on was that I just needed to relax and have fun with him. He would learn things as we went along. It turns out I had unknowingly already started teaching him a few weeks ago when I began setting aside some time for art sessions. I have to admit that I originally started doing this to distract him while I was getting dinner started, but that was a big flop. He needed my full attention to keep him seated there for more than a minute. Let's just say putting the paint out and cleaning it up were taking longer than the actual project. So I moved activity time up to right after his nap and made sure to keep myself fully focused on him. I've been desperately trying to teach him his colors so I broke out the crayons and paint. I'd constantly quiz him on what color he was using and tried to make sure he was doing everything in the right order. "First water, then paint, now paper....NO, not your fingers!...use the paintbrush." I'd be frustrated because he wasn't doing things in the correct way. After reading several blogs I figured out that it was me that was holding him back. I needed to relax and let him figure things out for himself. Fingers are okay in paint. Paint does not ultimately have to make it to the paper. Breathe. Stop quizzing. Just talk. Because he asked nicely, we actually did our art time early today. Today we played with Play-Doh. I cut out shapes of animals and told him what they were, what sounds they made and what color of Play-Doh we used. I try to keep the quizzing to a minimum and the fun to the fullest. Then he asked for his favorite toys at the moment...trucks! So we brought a couple over and I made "rocks" for him to haul and push around. I flattened some play-doh out and taught him how to make tire tracks. We both had a lot more fun. I was a ton less frustrated. Yes, we still had moments...there will be no throwing of the Play-Doh...and of course that led to toddler-like acting out, but overall we had a great time. Is he ready for a pop quiz? Nope, not hardly. But hopefully over time, he will pick up on the things I want him know. He will learn them because he had fun doing so not because I constantly quizzed him or printed out nifty worksheets. I so know what you mean! I was just thinking I needed to introduce Nolan to play-doh sounds like it is a big hit with Ethan! As a teacher (junior high), I am all about real-world experiences. When I am with Connor, We count the steps as we go up and down them. All. The. Time. He could count to twenty when he turned 2 because I repeated to him constantly. As far as colors? I talk about colors of his favorite things. He loves John Deere tractors. So we talk about John Deere green and John Deere yellow. Then when we are outside we talk about the grass also being green, or having a green popsicle, just so he knows that there is more to the color green than a crayon. Connor hates to color, so this works for us as far as colors are concerned. He started recognizing some letters, too. We have the Leap Frog alphabet magnetic letter set. I started with C for Connor and he will bring me that magnet. I used names he was used to. "Find me P for Pup Pup" or "G for Grandpa." While he doesn't know all of his letters, once again it relates to him, he can make the connection to the letter, versus just memorizing them. Also, because of that $20 toy that hangs on our fridge will all the magnet letters? He can sing the alphabet. 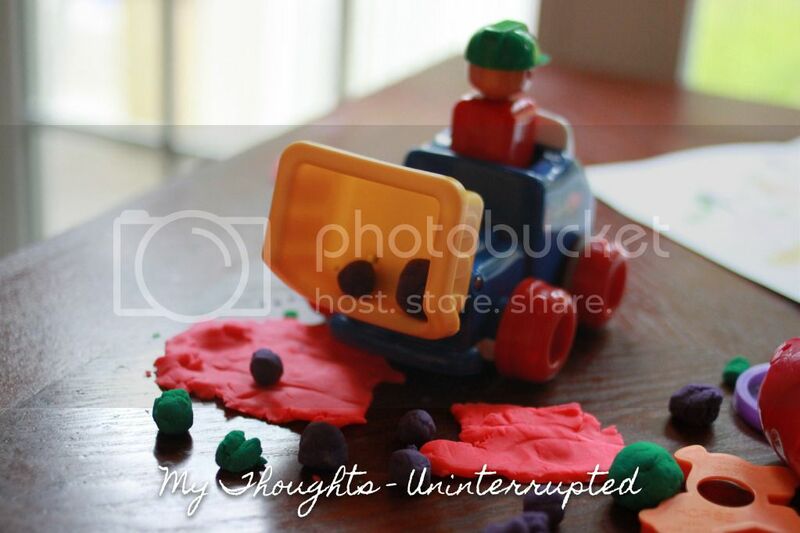 Thanks for the tip about using trucks with the playdoh! 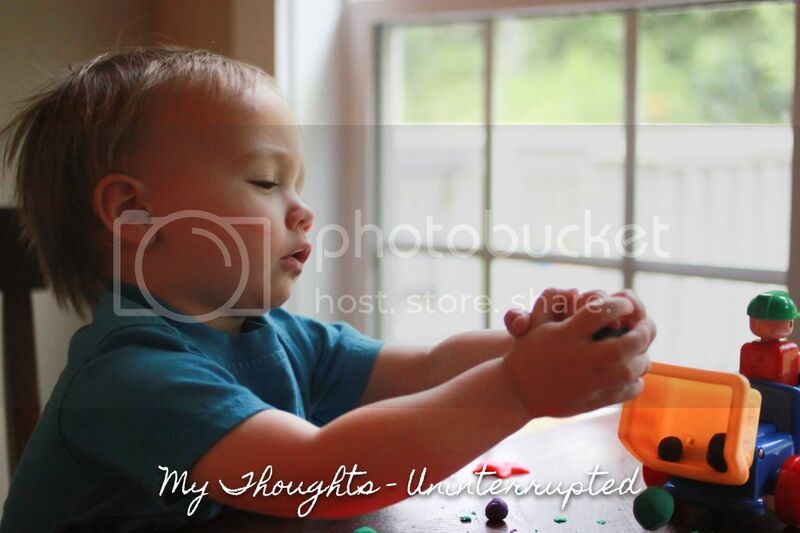 We have so many trucks and Connor loves playdoh. We will definitely be combining the two! I agree with Lindsey- count EVERYTHING! Spence can count to 20 (well, mostly) because they count all day at daycare and we count all the time at home. We count steps, we count groceries as we put them away, we count books, etc. We also have the Leapfrog alphabet for the fridge which SYT loves. Spence also love, love, loves to bake, so I use that as a teaching tool- what color is the flour, now we need 4 cups of this, let's count, what shape are chocolate chips, etc. Then if he gets it right, I'll give him a chip :) I think cutting out shapes out of felt for matching games would be a great learning tool for him too! It really is all about experiences and fun at this age. He'll get it all, I promise!! Does Ethan like puzzles? Spencer loves them and there are number and alphabet puzzles that are great (Melissa and Doug) that you could ask for for his birthday or Christmas. I definitely agree with lindsey. Real world experiences are the best teaching tools! Whatever is significant to them instantly creates interest. Carter loves pushing buttons, so i let him set the timer on the microwave when i heat anything up, and we count down to the all important "beeeeeep." Toddlers love to do what they see you doing, so I try to simulate my activites in toddler friendly ways. Cooking might mean he stirs a bowl of dry pasta while i make dinner. I throw in a measuring cup and funnel and it makes it fun. Laundry means he gets to push the buttons after he helps me load and unload, and we count clothes as we go. Chores means he gets to spray the furniture polish. "Lets spray three times. One, two three." Just some ideas!! absolutely adore your gender reveal video! Glad to hear your Play-Doh experience was better. I'm sure you'll get better as you go along. Keep up the good work, mama! Mama Said There Would Be Days Like This..